This is how my morning started today. 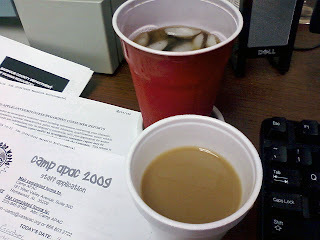 A second cup of coffee being tailgated by a Diet Dr. Pepper. My goal is productivity without a heart murmur...a fine line. If we took a closer look at your work "space," what would we find? Anywho - you remind me of me when I had a job. Many times I would fix myself a cup of coffee and have some Dr. Pepper right next to it! Yum! You would find that I am the perfect combination of OCD and ADD. I start lots of projects and never finish them. I have tons of papers that i took class notes on, but they weren't pretty enough, so i started rewriting them and never finished. It's dreadful. A pillow. I often work in bed! Diet coke, peanuts, pictures of the Family, Darth Vader and Yoda Bobble Heads, Military action figures..ect..ect..Oh and don't forget Red Tape..I do work for the Government ya know.. I: This is me typing with jealous fervor. CB: Umm...I definitely need some Star Wars bobble heads - how fun! Ummm...Jamie. Have you not yet discovered what the effect of two cups of caffeinated coffee, followed up by Dr. Pepper, is on a digestive system? Good luck with that. That's a lot of stimuli. Jamie, you ARE a Star Wars bobble head. C: I appreciate your fake concern for my digestive and nervous systems. K: I like a desk packed with yummies!